It wasn’t that long ago that you couldn’t watch ESPN without a cable subscription. ESPN and sports in general have been the anchor keeping people from cutting the cord for years. As more and more Americans cut cable, ESPN and other sports networks are rethinking their services. Rather than have their customer base resort to illegal streams to watch games, they’ve started adding their channels to apps and streaming services that don’t require a cable subscription. Today, there are plenty of different ways to watch ESPN without having a hefty monthly bill attached to channels you don’t watch. If you’ve been doing any research on cable cutting, you’ve probably heard of Sling TV. Sling TV is a subscription based streaming services that makes buying channels as al la carte as possible. Unlike cable, Sling doesn’t require a contract. In fact you can cancel it any time without an early termination fee. Sling TV is broken out into small packages and add-on packages that let you build your own service. Its two core packages are Orange and Blue and offer different channels for $20 and $25 dollars a month respectively. We have a full list of channels for both core packages as well as all of Sling’s add-on packages in our comprehensive Sling TV guide. If you’re looking for specifically ESPN though, you’re in luck. ESPN, ESPN 2, and ESPN 3 are all offered in Sling’s cheaper Orange package for only $20 a month making it hands down the cheapest option for ESPN without cable. Sling TV is similar to Netflix or Hulu and needs to be run on a device to play on your TV. While you can use Sling on your mobile phone or tablet, it gets kind of hard to watch the game with friends if you’re all hunched around your 5″ cell phone screen. We typically recommend Roku devices as a first choice for cutting cable, especially when it comes to Sling TV. Part of the reason is Sling TV’s Roku offer. 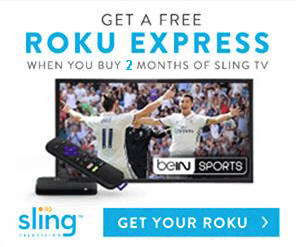 If you pre-order two months of Sling, you’ll get a Roku Express for free. If you were going to end up paying for two months of the service anyway, you might as well get a $29.99 device out of it. That $30 is an entire month and a half of Sling! If you’re unsure about making the switch to Sling, you can always use their 7 day free trial. It’ll give you a chance to check out the interface, experience the stream quality, and browse around some of their other channels to see if it fits your needs. Most people have heard of DirecTV and don’t initially see the difference between it and DirecTV Now. Unlike normal DirecTV, adding the “Now” to the end also removes the satellite. DirecTV Now is AT&T’s competitor to streaming services and doesn’t require a contract or satellite like it’s namesake product. It’s a bit more expensive than Sling TV, but comes with more channels right off the bat. Its smallest package, “Live a Little” costs $35 a month and includes over 60 channels. As DirecTV Now continues to update its offerings, we’re liking it more and more. It includes most major “must haves” by cord cutters including all four major broadcast networks (based on location). Like Sling TV, DirecTV Now includes ESPN, and ESPN 2, but ESPN 3 isn’t available. If you upgrade to their $50 a month package “Just Right” you’ll get 20 more channels added on including ESPNEWS, ESPN 3 and ESPN U.
It’s hard to argue with only $5 a month for Silicone Valley, Westworld, and Game of Thrones. If you’d like to see all of their channel and package offerings our DirecTV Now guide covers them in detail. Similar to Sling, DirecTV Now also offers a Roku deal. However, this deal has even less up paid up front. 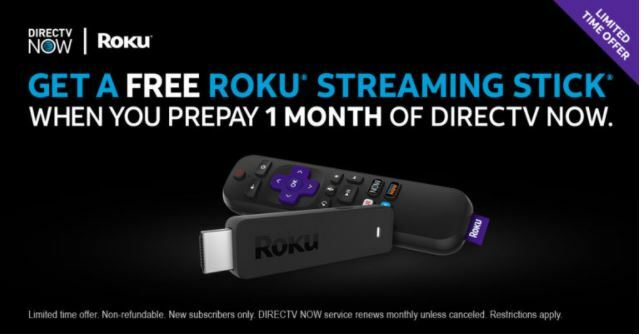 For only 1 month prepaid of DirecTV Now ($35), you’ll get a Roku Streaming Stick included. At $39.99, you’ll basically get a month of DirecTV Now for free if you were going to buy a Roku Streaming Stick anyway. YouTube has been a long time player in the video industry, but is a relative newcomer in live TV. Unlike YouTube.com, YouTube TV isn’t a free service. It costs $35 a month; the same price as DirecTV Now. However, we put YouTube TV just behind DirecTV Now because it comes with 20 less channels. Although it has less channels overall, YouTube TV is jam packed with some of the most popular ones. By avoiding “filler” channels, YouTube TV is able to offer a quality package for cheaper than you’d expect. Unlike the other packages mentioned so far, YouTube TV includes ESPN, ESPN 2, ESPN 3 and ESPN U for no additional cost. It also includes other sports favorites like NBC Sports Network, FOX Sports, USA, CBS Sports, and plenty of others. It even includes the Olympic Channel and is one of the top contenders in our article for ways to watch the 2018 Winter Olympics without cable if you’re interested. It’s clear to see that YouTube TV has a really strong channel line up, but it also brings something else to the table. YouTube TV’s DVR completely blows away the competition. It turns out that stemming from the largest online video database site in the world and being financed by Google has its perks. 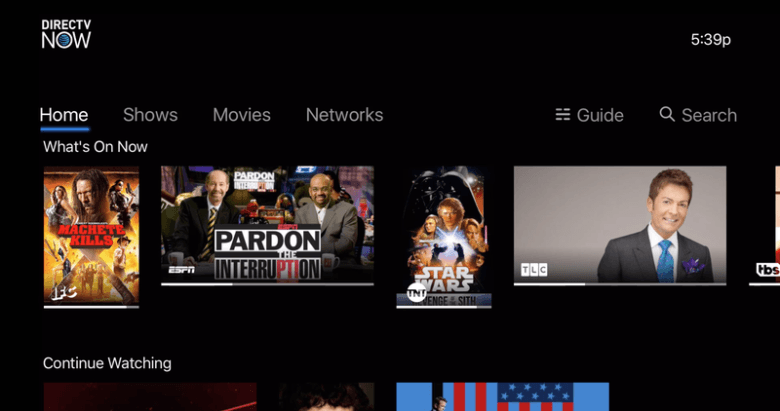 YouTube TV’s DVR is included in the service and allows an unlimited amount of storage. It will store any recordings for a staggering nine months, so feel free to record anything and everything you have a remote chance of watching. YouTube TV isn’t without its weaknesses though. Because the service is so new, it’s still rolling out onto major devices. It’s not supported by Roku, Fire TVs, or Apple TV which severely limits your options for streaming hardware. If you think YouTube TV is the best fit streaming service for you, we (and Google) recommend getting a Google Chromecast. Since they’re made by the same company, you can be certain that the integration between the two is simple and lasting. 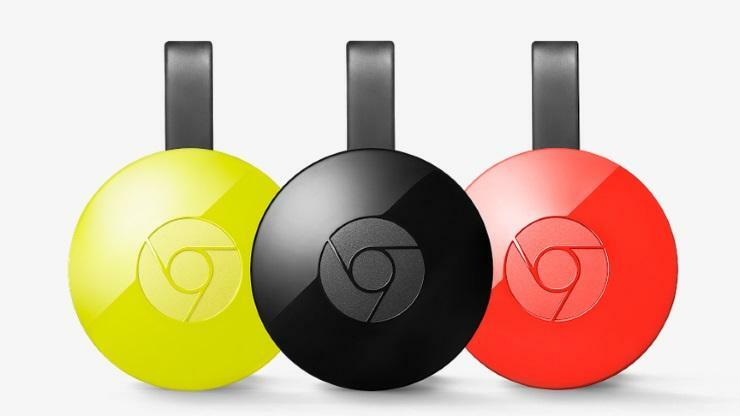 Google’s second generation Chromecast can be bought for $35 through the Google Store. To find out more about it, you can read our YouTube TV review that covers the strengths and weaknesses of the service. With Sling TV’s Orange package we were able to get 30 channels for $20 a month. PlayStation Vue is $39.99 a month, but comes with about 50 channels. It’s a little bit more expensive and has less channels than DirecTV Now, but shouldn’t be discounted. It’s unique channel line-ups frequently make it the cheapest option for a lot of people based on channel requests. Although the name is a little confusing, PlayStation Vue doesn’t require a game console to be played. It was originally launched by Sony on the PlayStation only, but was quickly added to other platforms as the customer base grew. It’s now supported on most major streaming devices like Roku, Apple TV, and Google Chromecast. It’s one of the better services for local channels and, depending on where you live, you can get NBC, FOX, ABC, FX, FOX News and a whole slew of other popular cable channels. The major advantage that PlayStation Vue has over DirecTV Now is its included cloud DVR service. DirecTV Now doesn’t offer any DVR service, included or otherwise, although it’s rumored to announce one early this year. 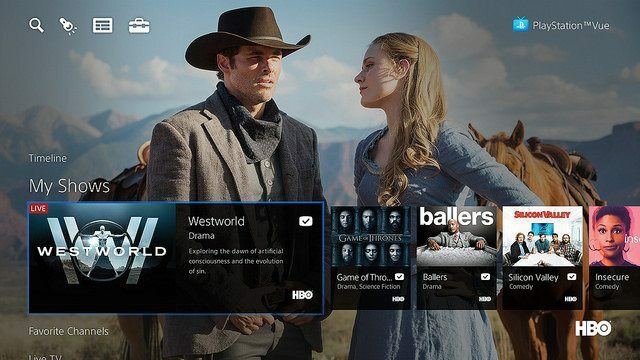 Like most services, its DVR can’t quite compete with YouTube TV’s, but PlayStation Vue’s DVR will save recordings for up to 28 days giving you plenty of time to catch any missed episodes while you wait for DirecTV’s DVR announcement. A recent feature that Sony added to the Vue’s DVR was an additional 50 minutes tacked on to the end of any sports broadcast. I don’t know how many complaints we’ve gotten from readers and friends about missing the end of some crazy double over-time because their recording stopped early. This new feature addresses the issue and will let millions of sports viewers rest easy. Hulu and Netflix are probably the first two services that come to mind when someone mentions streaming. Although most people know that Hulu is fantastic for on-demand content, not everyone is familiar with its live TV service. Hulu with live TV can be added to an existing normal Hulu account for $32 a month or purchased separately for $39.99 a month. While it may be more expensive than a few of the others, getting a Hulu with live TV subscription also gives you access to Hulu’s deep library of on-demand content. 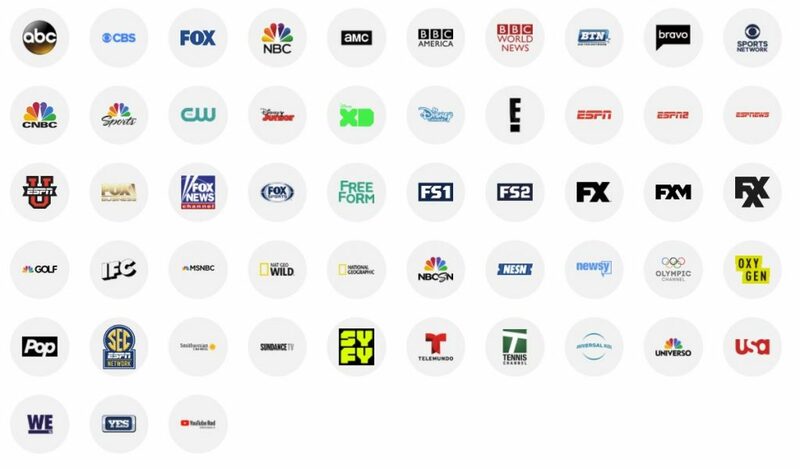 Included in a Hulu with live TV subscription is ESPN, ESPN 2, ESPNEWS, ESPNU, FOX Sports, NBC Sports, and plenty of other channels. The image below shows available channels near Boston to give you an idea of what you can expect. The exact package available to you will depend on your location and is view able through Hulu’s site. A benefit of being such a name sake in streaming is that Hulu runs on basically any device you can imagine – iOS, Android, Xbox, Apple TV, Fire TV, Google Chromecast, and some brands of Smart TV. The DVR included will record 50 hours of programs, but that can be bumped up to 200 hours for an extra $15 a month. The extra money might seem like a lot for “only” 150 hours of storage, but it also comes with the ability to skip commercials in your recorded programs. If you’ve ever watched Hulu without the ad-free version, you can understand how repetitive and long the commercials can feel.